Tons of Rock 2018 will be nothing less than incredible. 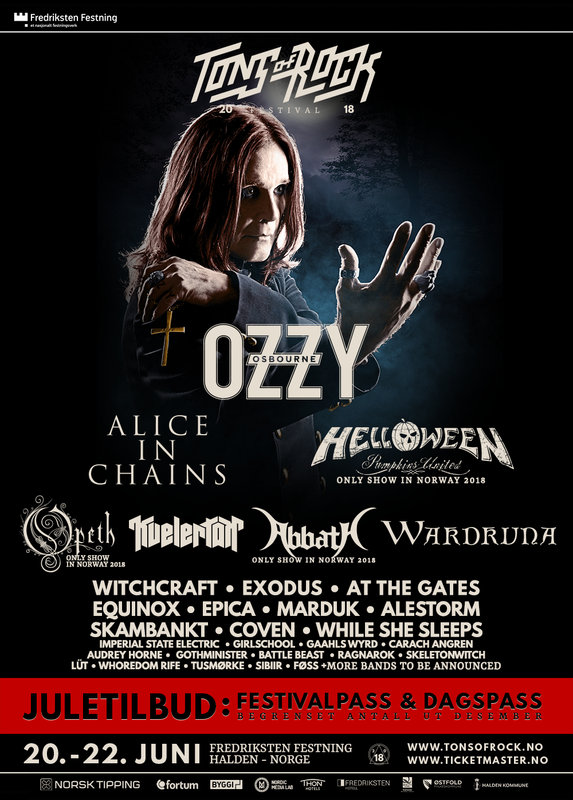 Ozzy Osbourne, Alice in Chains, Helloween, Kvelertak, Equinox and many more are set to perform during the festival. We are now announcing 7 new Christmas surprises for you to be excited about! The festival will have exclusive concerts with OPETH, WARDRUNA and ABBATH! We are also announcing gigs with Witchcraft, Coven, Gothminister and Ragnarock, which could only mean that 2018 is going to be a party of a year for Tons of Rock! Make sure you take advantage of our Christmas offer, with great deals on festival tickets and day passes throughout December! It is always worthwhile to purchase your tickets for Tons of Rock early on, and like previous years we are offering a reduced price on festival tickets and day passes through 2017. This is a perfect chance to get a hold of your tickets for a very good price, or to but the heaviest Christmas present ever! We would also like to remind you that you are now able to purchase our hotel deals and VIP deals, both of which have limited tickets left. We are incredibly proud to announce that Alice in Chains, one of the biggest and most influential rock bands in the United States, is coming to Tons of Rock 2018. The band has received a number of nominations for the Grammys and sold more than 20 million albums. They have influenced a whole generation with their modern heavy rock and will be making a rare visit to Norway, Thursday 21st of June. This week we also announced that Ozzy Osbourne is playing at Tons of Rock 2018, and the feedback was positively buzzing! Today we can finally reveal that the legendary GIRLSCHOOL, who are celebrating their 40th anniversary, will be joining our festival line up along with LüT, one of the hottest rock bands in Norway and recent nominees for «Best live artist in Norway» at P3 Gull. OZZY OSBOURNE TO TONS OF ROCK 2018! Five decades, 18262 days and more than 2500 shows worldwide. His career is incredible and mythical, to say the least. Since the early 60s Ozzy Osbourne (68) has been ravaging stages globally as the leading man in the legendary Black Sabbath. The Godfather of heavy metal has had even more success during his solo career, and have sold more than 100 millions albums combined. The upcoming farewell tour of Ozzy Osbourne, a Rock & Roll Hall of Fame inductee and Grammy award winning singer and songwriter, will celebrate more than five decades as live artist. The trek will take singer around the world through 2020. 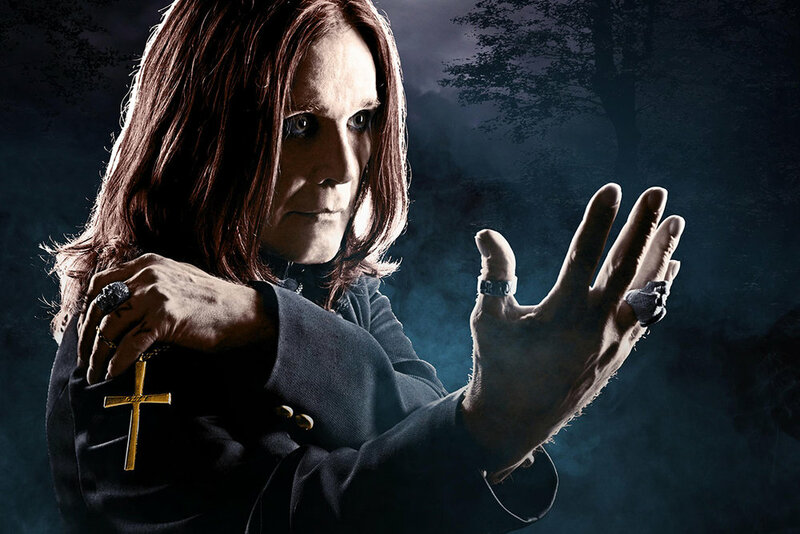 And while this tour marks the end of of an era for Ozzy as a touring artist, the navy metal legend plans to continue doing live shows following the end of the tour. "People keep asking me when I’m retiring," Osbourne said in a statement. "This will be my final world tour, but I can’t say I won’t do some shows here and there." HELLOWEEN AND KVELERTAK + 17 OTHER ARTISTS ARE READY FOR TONS OF ROCK 2018! In the last two years we have been visited by more than 20 000 music lovers and artists such as Black Sabbath, Slayer, Alice Cooper and Five Finger Death Punch, to name a few. This year marks our fifth year of filling Fredriksten Fortress with a collection of the world’s most kickass rock and metal bands. We’ve been working around the clock since last spring, and we can guarantee that this anniversary will ve celebrated in style. Today we are announcing the first 19 artists and in the weeks to come we will continue to announce bands that will shake up the fortress.